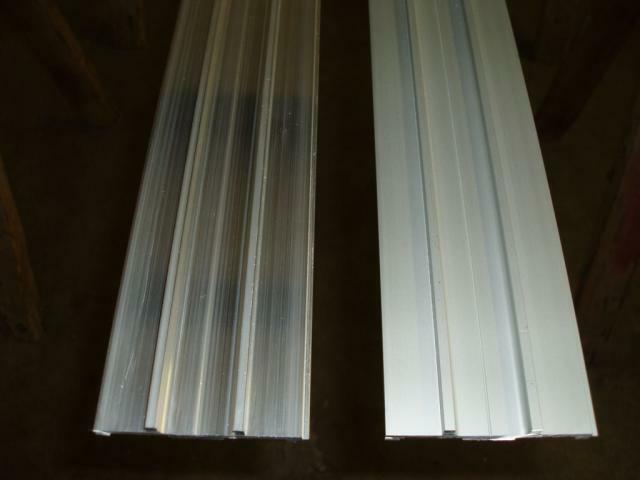 A mill finish is the natural finish that extruded aluminum has when it emerges from the extrusion die. It is basically a bare aluminum surface that will oxidize (forms aluminum oxide) as it is exposed to air. The aluminum oxide appears as a light white powder on the aluminum surface. Anodizing is a process that oxidizes the aluminum in a controlled environment and it creates a very thin very hard surface on the aluminum. This provides a much more durable track surface than a mill finish track. We believe in the anodizing process so much that it is the only track we sell. Anodizing is not like paint. It cannot be removed by solvents and is not easily scratched. Aluminum is immersed in a tank containing an electrolyte having a 15% sulfuric acid concentration. Electric current is passed through the electrolyte and the aluminum is made the anode in this electrolytic cell; the tank is the cathode. Voltage applied across the anode and cathode causes negatively charged anions to migrate to the anode where the oxygen in the anions combines with the aluminum to form aluminum oxide. Aluminum oxide is grown out of the surface during anodizing and then becomes aluminum hydrate that is extremely hard. The surface will be a cosmetically pleasing uniform 'satin' silver that will be less susceptible to scratches. Anodizing is an electro-chemical process which physically alters the surface of the metal to produce a tough oxide layer on the surface. It should be noted that as the anodized surface is a layer of aluminum oxide, rather than metal, it exhibits a very high resistance to electric current. Many metals are structurally weakened by the oxidation process, but not aluminum. Aluminum can actually be made stronger and more durable through 'anodizing'. Anodized aluminum can be nearly as hard as diamond under the right anodizing process. Anodizing is not an inexpensive option, however, our purchasing volume affords us the opportunity to provide this service at a competitive price. Our experience has been that even after ten years the anodized track looks like new. We believe in the anodizing process so much that if you get a scratch on the surface of your anodized track, ship it to us and Derbywizard will replace it for only the price of shipping.